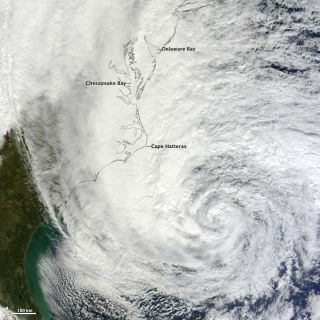 At noon Eastern Daylight Time (16:00 Universal Time) on October 28, 2012, the Moderate Resolution Imaging Spectroradiometer (MODIS) on NASA’s Terra satellite acquired this image of Hurricane Sandy off the southeastern United States. The full moon of October may go unseen along the U.S. East Coast due to Hurricane Sandy, but its effect on the storm will be felt. The full moon's tidal effects on Earth will amplify the storm's already large waves, making them a bigger flooding danger than normal, NASA says. "Very rough surf and high and dangerous waves are expected to be coupled with the full moon," NASA spokesman Rob Gutro explained in the agency's hurricane status report Sunday (Oct. 28). "The National Hurricane Center noted that the combination of a dangerous storm and the tide will cause normally dry areas near the coast to be flooded by rising waters." The National Hurricane Center said that "Sandy [is] expected to bring life-threatening storm surge flooding to the Mid-Atlantic coast including Long Island Sound and New York Harbor, winds expected to be near hurricane force at landfall," according to Gutro's update. As of Monday morning, Hurricane Sandy is currently a Category 1 hurricane with wind speeds of up to 85 mph (140 kph). It is moving north-northwest about 20 mph (32 kph) and is merging with a cold front to create a single, more dangerous, super storm that measures nearly 2,000 miles across (3,218 kilometers), covering much of the eastern United States. Weather forecasters have dubbed the huge storm a so-called "Frankenstorm." The higher tides during a full moon occur because at this time the sun, Earth and moon line up with our planet in the center. The cosmic arrangement allows the gravitational pull of the sun and moon to reinforce one another, creating stronger tides on Earth. A similar effect occurs during the new moon, when the sun, moon and Earth line up with the moon in the center. In fact, the tides during the full moon and new moon are also dubbed "spring tides," taking their name from the German word "springen" (to spring up)," SPACE.com's night sky observing columnist Joe Rao has explained. Conn./R.I. border to the south shore of Cape Cod including Buzzards Bay, 3 to 5 feet. NASA and the National Oceanic and Atmospheric Administration are keeping track of Hurricane Sandy with a fleet of satellites, some of which have provided amazing views of the storm from space.